No, almost 12 months ago I started AND finished my first ever marathon, the 35th Perth Marathon to be precise. I didn’t know it then, but in doing so I closed a chapter on my life, and opened up a new one, one that was actually blank, waiting to be written, drawn, scribbled on… a life full of positives, great friendships, rediscovering who I am, adventures, passion, drive, desire and optimism. In so many ways, the marathon saved my life, saved me from myself, who I had become. Since then, life itself has become a bit of an ultra-marathon – constantly giving me options, offering me choices between what I truly want and an easy way out; so far I’ve passed 12 months of such tests, made good decisions, and been rewarded at every step of the way (London Marathon is an obvious “reward”, but there has been so much else). I know it’s a cliche to say “it’s a marathon not a sprint”, but that’s really the most valuable lesson that getting fit, losing weight and finishing a marathon has taught me. By applying that lesson to all areas of my life, I found the will, the courage and the endurance to go after what I really want, to fill my existence with people, experiences and feelings that I want life to be composed of. And now the 1 year anniversary of that momentous event is impending, a sort of NMMFG official birthday, or should I say re-birthday! and how am I celebrating it? By running in the Perth Marathon of course! On the day I will talk to, meet, encourage, cheer and high-5 a whole heap of runners – a lot will be people I know via parkrun, many more through various local running events. I do need to make special mention though of Rogue Runners Club Australia…. The Rogues have played a big part in my development as a runner – a massive source of inspiration, support and friendship. 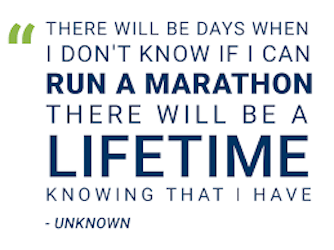 I had originally hoped to be part of a massive Rogue Wave, running the full marathon distance on behalf of Believe in Blaise – sadly I had to can that idea, and reduce my distance on the day, but I will still be there in the relay! They will all be proudly “Running Rogue” on Sunday, and I very much look forward to catching up before and after, and exchanging fist bumps and high-fives out on the double lap out-and-back course. Crossing the finish line is something else. Crossing the finish line will fill you with a sense of accomplishment beyond measure, you will know that you worked hard for every single one of those 42km and especially enjoyed the 195m tacked on the end. You will know that you faced demons, mental anguish, physical pain. You will know that you looked fear in the face and made it stand aside, you will know that you refused to take the easy option, no matter how many times it is offered. Whether it is your first marathon or your one-hundred-and-first, by the time you get to 32km it will be cruel, harsh and demanding, every single time. Enjoy it, embrace it, and enjoy the feeling of being changed. forever.